Hi everyone, this is Angel Acebes-Doria, the pecan entomologist. Dr. Wells has given me the permission to post on the Pecan Blog regarding topics on pecan insect pest management. 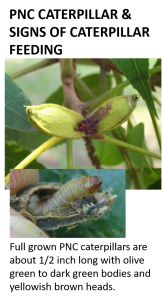 On my first post, I will talk about pecan nut casebearers (PNC) as it is that time of the year that we would expect to see them in pecan orchards. With the crop being behind this year caused by the unusually cooler weather we’ve been having, pecan nut casebearers may be slightly behind as well. I deployed nut casebearer traps at Ponder Farm, Tifton, GA and the traps consistently captured increasing number of moths in the past 4 days. This does not mean that PNC will become a problem, this only signifies that after 10-14 days from now, we could expect to see nut casebearer eggs. I would suggest to start scouting for PNCB eggs within the next 10-14 days (see guide below). 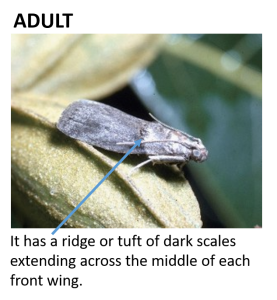 Take note that light infestations of this pest do not require control in most years according to Dr. Ted Cottrell at USDA Byron who has extensively researched the management of this pest in Georgia. In fact, in years with good crop load (like this year as confirmed by Dr. Wells), PNC may help thin the crop a bit. So you can forego spraying for them in most cases and let them help you in thinning some of your crop. 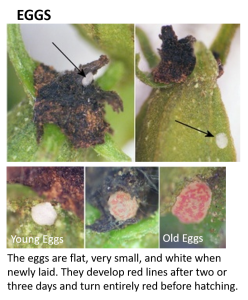 However, if you do decide to treat for them or you have problems with them in the past year, try to time your sprays 10-14 days after the peak captures in your traps and only spray when you see PNC eggs or caterpillars on clusters. Please check the Grower Handbook for the products you can use with their corresponding rates. However, I would NOT recommend broad spectrum insecticides such as pyrethroids and chlorpyrifos be used against this pest early in the season as doing so will negatively affect beneficial insects which could then lead to early aphid outbreaks. 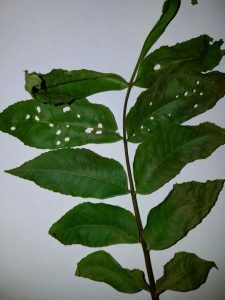 Eggs and Caterpillars: Sampling can be done by checking nut clusters for eggs using hand lens. Below are some pictures you can use as guides for identifying different pecan nut casebearer life stages. Adult: If you have pheromone traps deployed, you can identify nut casebearer adults by looking at the ridge of dark scales indicated below. Do not confuse them with other moth species that sometimes end up in the traps. SAWFLY: We have received reports of sawfly injury as shown below. They do not really cause much of a problem in most cases, not unless, they have caused considerable defoliation on young, small trees. If you decide to control for sawflies, products for caterpillar control are effective against them with the exception of Intrepid. Posted in Insect Management. This entry was tagged casebearer, sawfly. Bookmark the permalink.